The annual OHL Cup takes place this week and features 20 of the best Minor Midget AAA teams from across the province. Organized by the Ontario Hockey League, there will be seven teams from the Ontario Minor Hockey Association competing for a gold medal. Teams from across the OMHA that are playing include the Minor Midget AAA Champion Whitby Wildcats, Halton Hurricanes, York-Simcoe Express and Quinte Red Devils. The Guelph Jr. Gryphons, Niagara North Stars and North Central Predators will play in wild card play-in games. To qualify for the tournament, the top four teams from the OMHA Minor Midget AAA Championships automatically earn spots. The fifth place team (Guelph) earns a wild card spot as does the winner (Niagara) of the OMHA-SCTA consolation game. In addition, three wild card teams from across Ontario are determined by a selection committee and North Central was chosen as one of them. The Express won the tournament in 2016 in a thrilling double-overtime victory. Since switching to the Minor Midget age group format in 2003, other OMHA teams to capture the OHL Cup include the Oakville Rangers (2013), Markham Waxers (2006) and York-Simcoe (2004). The Richmond Hill Stars took home a silver medal in 2004. The action takes place March 12-18 at Scotiabank Pond in Toronto. You can find more information about the OHL Cup including the schedule and standings here. 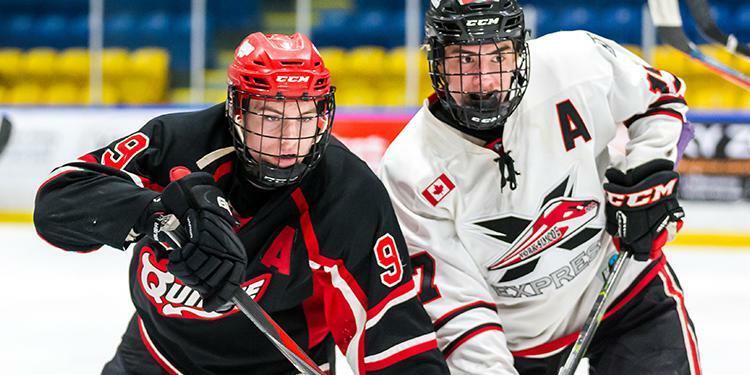 Here is a quick breakdown of what to expect from each team at the OHL Cup. Guelph Jr. Gryphons: Guelph gained valuable experience during the OMHA championships and nearly found themselves playing for a bronze medal. They showed they aren't to be underestimated and will be a factor in this tournament. Halton Hurricanes: The Hurricanes will be looking to build on their silver medal performance with a strong showing at the OHL Cup. They are no doubt looking to get rid of the sour taste and improve even further on what they accomplished this season. Niagara North Stars: After coming through in a winner take all qualifier game for a wild card spot the North Stars are already used to the pressure of the tournament. While they never made it to the OMHA Championships the North Stars were still ranked as a Top 5 team all year long. North Central Predators: The Predators boast three members of Team Ontario, a nod to the talent level they possess. They have always been in the conversation for the number one spot in the OMHA and are out to showcase why they won't be an easy out. Quinte Red Devils: The Red Devils turned a hot second half of the season into a fourth place finish at the OMHA Championships. They know what it takes to compete with the best and are in a position to surprise a lot of teams. Whitby Wildcats: The Wildcats proved that they are the best Minor Midget team in the OMHA after capturing the gold medal on championship weekend. They are looking to double their hardware by bringing home the OHL Cup as well. Whitby has consistently been one of the top teams in the province all year. York-Simcoe Express: After settling for a bronze medal the Express want a better finish at the OHL Cup. When the Express beat the Wildcats in a qualifying series for championship weekend it became clear they can beat any of the top teams in this age group.